With our Shopify integration, you can offer specific gift card codes straight from Voucherify’s campaigns. Just connect your shop domain, and Voucherify will do the rest. Once a customer purchases one of your gift cards, Voucherify will automatically deliver it via a nice looking and customizable email. You can offer multiple gift cards with different value and expiration dates. Finally, you will be able to watch their performance in the Dashboard. Besides an active Voucherify account, the app requires a Mandrill account to send emails. 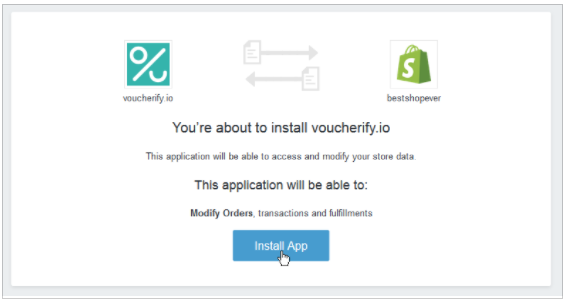 Voucherify Shopify integration enables you to automate the process of selling vouchers for your services or goods. 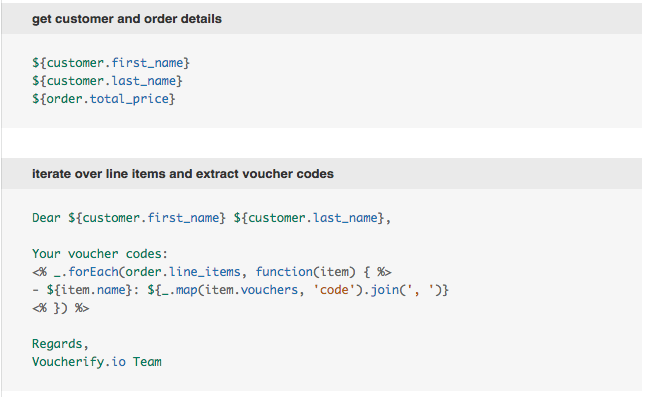 The plugin sends unique voucher codes to customers who paid for their orders. Once you log into your shop, you will be asked to give permission for the app to modify orders. The app needs that to register a trigger on order payment and to mark processed orders with a tag. Click the Install App button to finish the installation. After installation, you will be taken to configuration view. 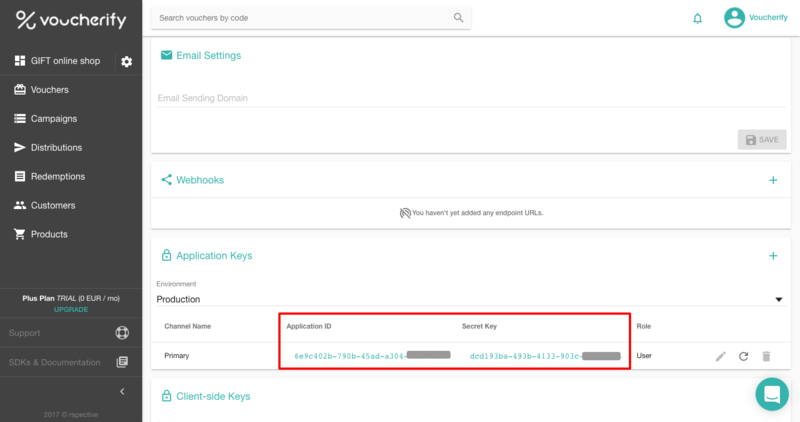 Note: you can also access the configuration view from your shop's admin panel - navigate to Apps and click on the voucherify.io app. First, you will need to obtain Voucherify Application ID and Application Secret Key. You can get them from Voucherify Configuration. Copy and paste them in the first and second field of the app's configuration. Next, enter a campaign name that includes vouchers you want to sell. If you don't have any campaign yet go and create one. If both product and variant specify custom campaigns then variant will take precedence. Now it's time to setup up the email section. The first thing needed here is a Mandrill API Key. Sign in to Mandrill or create a new account if you don't have one yet. 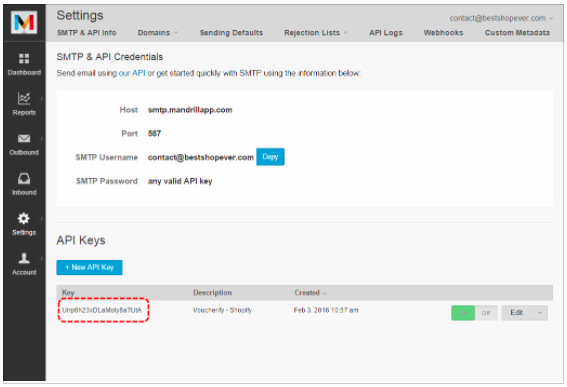 Go to Mandrill Settings to get or create an API Key. In the next step type in an email address that will be used to send vouchers. 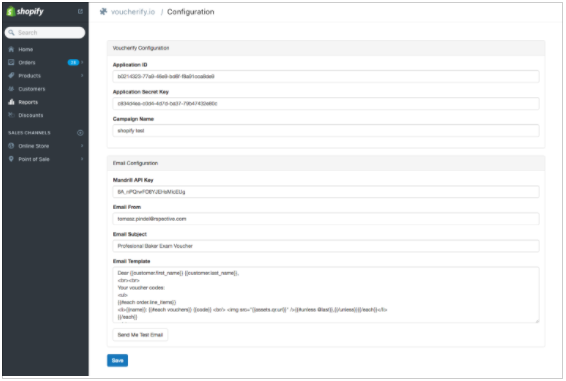 Make sure the email domain is configured as Sending Domain in Mandrill. The last 2 fields Email Subject and Template are totally up to you. In the email template, you can use customer and order variables . Each order item (order.line_items) is enhanced with vouchers list - as many as the quantity of the item. Shopify app gives you two main mechanisms to define email content. The user can define email body either in plain text or HTML syntax. If you decide to implement an email content in HTML, you will have to use syntax similar to this from Handlebars.js framework. You will find useful examples below. In Plus plan you get access to QR codes generated for each voucher. The app works in the background. 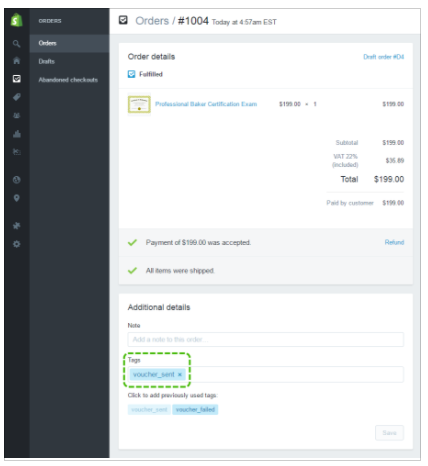 Once an order is paid an email including voucher codes is sent to the customer. The app marks processed orders with a tag: voucher_sent if everything worked fine or voucher_failed if there were some troubles. 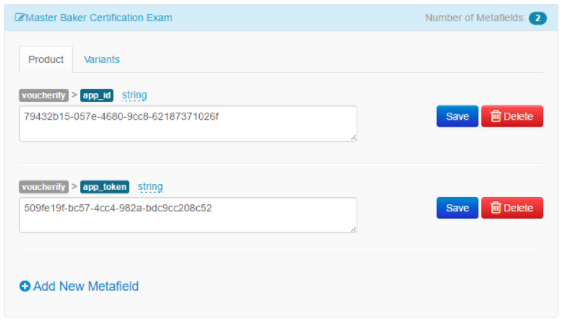 A voucher_fail tag is usually caused by an error in the configuration (e.g. invalid API keys, not existing campaign) or because there are no more unpublished vouchers in the provided campaign. If you are struggling with sorting that out, don't hesitate to contact our support. We are here to help.